Being busy is the norm for so many of us these days. This in itself isn’t necessarily a problem but when it becomes a way of life and you find yourself unable to relax and de-stress after a full day, things can unravel very quickly - I know, I’ve been there many times. Sometimes, all it takes to break the cycle of perpetual busyness is a little time for ourselves to do something that feels nurturing, relaxing and well, fun! Online art courses are a brilliant way to unwind, express yourself and play. I know, play seems a potentially shocking word for us adults but I bet the idea of play seems enticing. Virtual courses, ecourses, online classes - they all mean the same thing and they can include pre-recorded video (which is what my art courses are primarily made up of). They can also include writing - like a blog post, photos, slideshows, audio and sometimes the facility to leave comments or even start a group discussion (live or not). Sometimes the videos are downloadable (mine often are) so that you can keep them right on your computer too. My courses are ‘self-paced’ which means that once you purchased the course, you get to create when it’s convenient for you and in my experience, both for myself and my students, that seems to be ideal. The other great thing, is that wherever you are in the world, you can purchase and gain access to one of my courses with only a computer and access to a fast broadband connection and you’re good to go. So how can online art courses help with stress? Well my students tell me (and I know from personal experience) that there’s something about tapping into our creative side that helps us put to one side the stresses and strains of our busy lives. Creativity can help us connect with our inner lives and reduce stress. I’m a firm believer that we are all creative and that we don’t tend to the creative part of our lives nearly enough. After all, if we take care of our own needs, we are better able to be present with our loved ones - you can’t fill someone else’s well if you feel empty. I also believe that our ‘creative muscle’ gets stronger, the more we engage with it. This article from The American Public Health Association shares clearly how beneficial creativity can be in all our lives. Recently I listened to the brilliant SuperMum podcast hosted by Lisa York (Mum of four). Her guest was Dr Pragya Agarwal of The Art Tiffin and they discussed How Can We Support Our Mental Health With Creativity - a must listen! 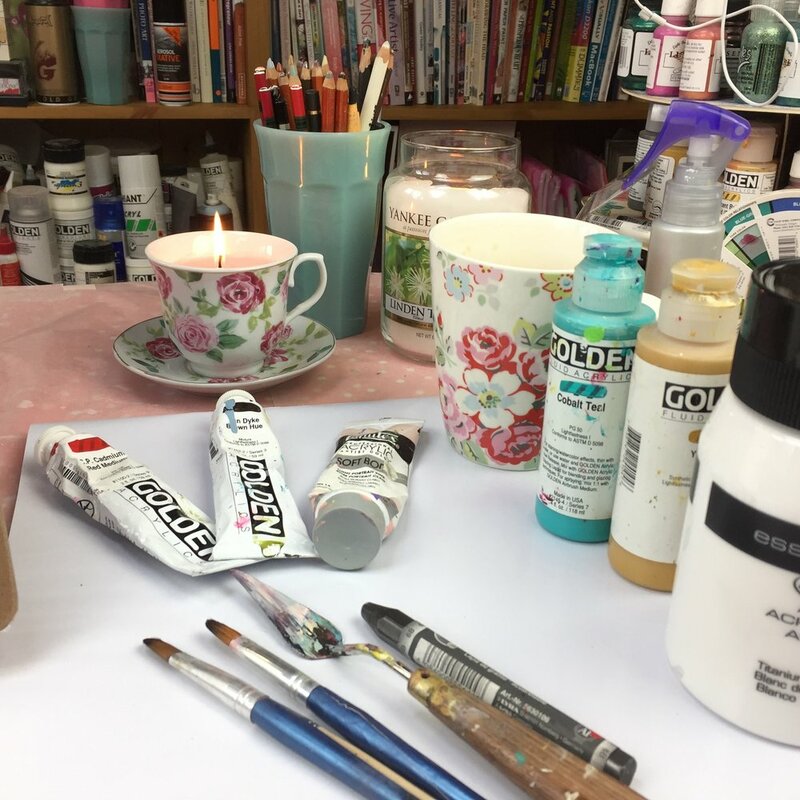 Finally, I hope this has inspired you to think about pulling those paintbrushes and paints out of the cupboard and perhaps taking one of my online art courses so that you can start tapping into your creative self and park that stress!